The following information is kind contribution by our forum members Lydux and Caius and this fix was applied to X68000 SUPER and Expert HD. The symptoms: X68000 powers on fine, but does not shut down when the soft-power button is pressed. The screen fades, Power LED does not change from Green to Red and the PSU fan keeps spinning. The same happens with a regular ATX PSU. If this is your case then the problem is almost surely located on the IO board. 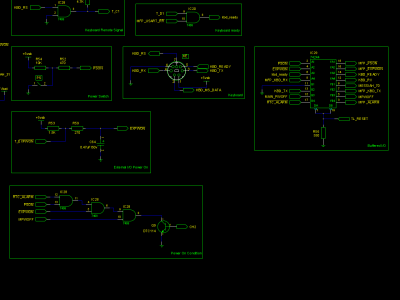 Here is the power on/off logic behind the /PSON signal (named CH2 in the schematics). Click on them to enlarge. In normal operation, all these 4 signals must go to logic High (+5v) to get a system shutdown. The problem might be due to a signal that is always stuck Low. If you look at the Buffered IO part in the schematics, 3 of these signals are connected to the MFP GPIP port. RTC_ALARM = 1 or 0, depending on the current RTC configuration. Check the expansion riser, or remove it. Check the “Remote” plug on the back, if I remember right, it's also connected to this line. Bad IC28 (74LS08) (stuck output). Bad C64 capacitor (generating noise). IC29 (74LS244) might have bad output on pin 5. The power signal from the main board, which I miss infos actually. A fix to this could be soldering a 10K ohm resistor between IC28 pin 10 and 14.